I was at the back of the bus, so only heard a bit of their conversation, but Valeriy started talking to this lady, realizing she missed her stop and had to backtrack to get to her destination (which I think I heard was a hospital or doctor). And so what did Valeriy do? Valeriy, en route to his job (at least we figured he was going there — nevertheless, he was completely changing his plans for the day), got off at the next stop with the woman, as if she was a family member of his, helping her down the stairs and to the cross the street, to catch another bus to take her where she needed to go. And that's the type of kindness we experienced every day from people in Lutsk, whether it was on the street, at a store, or in rehearsals with the ensemble. This is part of the reason Lutsk is one of my favourite cities I've lived in during these past nine months. The other part(s) of the reason why Lutsk is at the top of my Ukrainian city lists? Contrary to what some people told me about the city, there is plenty to see and do. In the latest issue of What's On Kyiv, I wrote an article about Lutsk, saying Golovan's home is a good representation of the city — it's "quirky, a little rough around the edges, but definitely a sight to see." Mykola Golovan has been working on his home for more than 35 years, covering the outside, inside, and surrounding areas with sculptures. Animals, humans, creatures between animals and humans — all with stories to tell. Also, if you make the visit, maybe you'll catch a glimpse of Golovan. My friends and I did. I've heard that if you ask him, he may give you a tour of the inside of his home, which is supposed to be just as incredible as the outside. 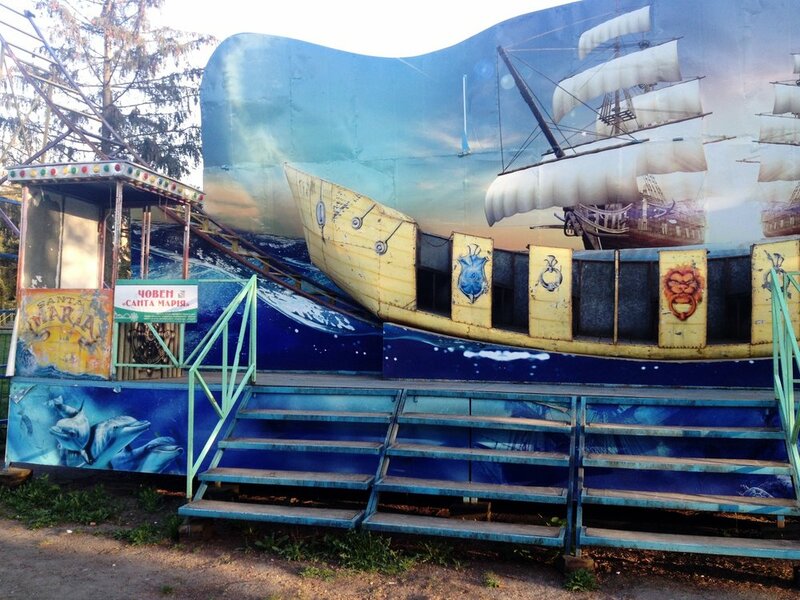 Around Lutsk, you’ll see sculptures of the town crier, someone who makes announcements for an area, in various poses. But Golovan made his own sculpture of the crier at his home, which he says is a true representation of the professional messenger. Photo by one of my parents. I'm still getting used to the fact that on my daily walks in Ukraine, it is not out of the ordinary to see a castle down the street. Lutsk Castle, or Lubart's Castle (named after the Lithuanian prince who built it), dates back to the 14th century. It's about 15 minutes from the city centre, and right next to one of my favourite Lutsk attractions — the market. This castle is featured on the 200 UAH bill (equal to about $10 CAD), the second highest Ukrainian banknote denomination. Lubart's doesn't have an overwhelming amount of ground to cover, compared to other castles I've been to this year (I've been to a LOT of castles ... not complaining, though I am just about castled-out). Sometimes there are different events going on in the castle courtyard, like food and drink festivals, which would be fun to attend. There's also a bell museum and book museum within the castle, which were actually quite interesting. Kaitlyn plays a tune on a giant glockenspiel. Savannah, Natalya, and Hannah gear up for a snowball fight with the son of one of the dancers who took us to the museum. The real fun in a city happens in the markets. Not a souvenir market, but a local market, that has everything from clothes to shoes to chickens to produce. And yes, perhaps souvenirs too. Lubart's Castle overlooks the Central Market. 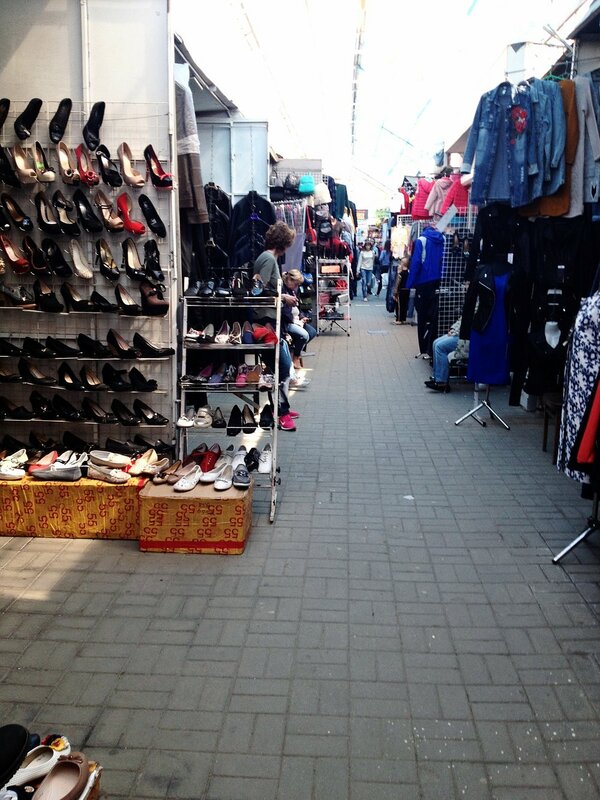 I went to two markets in Lutsk that I would recommend checking out. They are at the top of my list for best markets I've been to in Ukraine. Central Market is right next to the castle. When my godparents visited me, they went to the castle, and my godmother was interviewed for TV about the location of the market. There's talk of moving the market and replacing it with something more aesthetically pleasing, perhaps a tourist attraction, because of its proximity to the castle. But for me, I loved the location. It's close to downtown, and the appearance doesn't bother me. The other market, Varshavsky Market, is near PortCity mall. If you have a lot of time in Lutsk, PortCity is worth going to for a more Western shopping experience, since it's just a regular mall (but not so regular because this is Ukraine, after all). Varshavsky Market is giant. It's like a maze, but after a couple visits, we figured our way around. A couple booths over you'll find the correct spelling. ("Don't just sit back and wait, create your own future!") But where's the fun in that. I should also make clear that we didn't go to the markets just to shop. Maybe we were keeping our eyes open for an item or two, but we went for the experience (and for the shawarma lunch). The English mistranslations on clothes. The workers pulling out a handwritten map of the market to find the left shoe to the right shoe you tried on at their booth. The people taking a break from it all at the market bar. So yeah. It's an experience. Markets start to close around 2:30 p.m. or 3 p.m., so go in the morning for the most selection. Prices are lower than in Ukrainian stores, and I find they have more of a selection at markets. You just have to be OK with trying clothes on in a makeshift changeroom at a booth, and you have to be OK with someone maybe opening up the curtain to see how it's fitting, without first asking if you were fully clothed (but this isn't only a market thing — it happened to me at a mall too). The pedestrian street, closed to vehicles, leads you to old town Lutsk, where the castle is located. At the start, you'll find the "I ♥ Lutsk" sign. Lesi Ukrainky is lined with stores, restaurants, cafes, buskers, and is a nice place in general for a walk to take in Lutsk life. 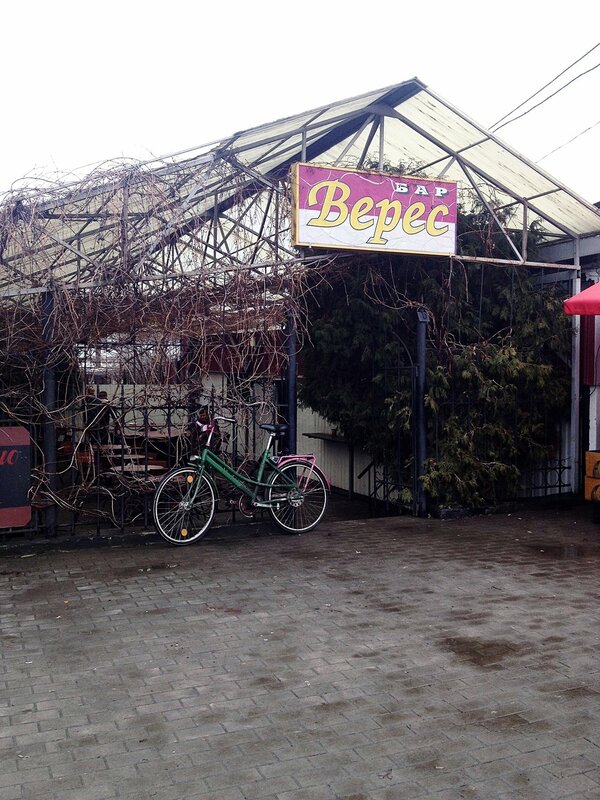 One of my favourite spots is Сімейна пекарня (Family Bakery). It's a great place to stop for a coffee and a pastry on the way to your next adventure, which in my case was more often than not the market. I'm not a zoo person, so Lutsk's zoo already had a disadvantage. Plus we went when spring just hit Lutsk. There wasn't much greenery and the zoo workers were only starting to plant flowers, so it probably wasn't the most photogenic time to go. But we heard it was worth checking out, so one free afternoon we went since the weather was nice and it costs only a couple bucks to get in. There are some interesting animals, like bears, monkeys, lions, and tigers, and many common animals, like chickens, goats, and ravens. Some of the enclosures were less than stellar — crowded, small, and unkept. Overall, I don't think the Lutsk zoo is a must-see attraction in the city. The Lutsk Palace of Culture and the Volyn Academic Drama Theatre, both located at the start of the pedestrian street Lesi Ukrainky, often have music and dance performances. Ticket prices vary depending on the show you're at, but in our case were less than $10 CAD. We saw the Volyn ensemble, dance schools, and Virsky perform. There's also the Palace of Youth, where we watched the Radist dance school's year-end show. If you're looking to provide your own entertainment, then head to Luchesk Pub (named after the original name of Lutsk) for some karaoke. Try their "ale" drink, which is beer and cherry juice. We went with some of the Volyn dancers our second week with the ensemble, and we ran into some choir members. "I'm singing karaoke with the Volyn choir!!!" will forever be one of the most memorable texts I have ever sent to my mom. Also, if you can't decide between karaoke-ing and clubbing, head to Versailles. I'm not one for clubs, but this place had great music, good drinks, and fun company. Joryc Kloc played at Obolon in Lutsk on April 27. We also went to Obolon, a restaurant and pub, based on dancers' suggestions, and we were not disappointed. 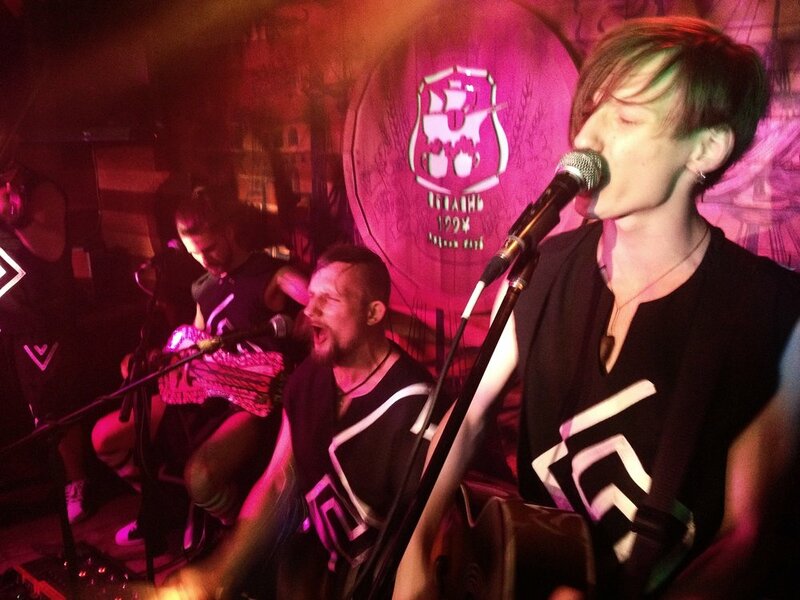 We even saw one of my favourite Ukrainian bands, Joryj Kloc, perform there. It was a sold-out show, but thanks to some special connections, we managed to get in, standing two feet away from the band members themselves. We travelled out of Lutsk, staying within the Volyn Oblast (province), with the Volyn ensemble twice. The first time, we went to the town Kovel, which is about an hour drive from the Poland border. The second time, we went to Lokachi, which was smaller than Kovel. It's nice to get out of the big cities once in a while and explore other parts of the oblast, so these were good opportunities for that. About an hour from Lutsk is the Tunnel of Love in Klevan, Rivne Oblast. If you happen to be driving by, sure, make the stop, but it really isn't much more than a photo op (and an ice cream stop). The Tunnel of Love is a section of a railway line that has trees creating a canopy over the track. It is a beautiful sight, if you go at the right time of the year — try winter for snow covered trees or late spring/summer when the leaves are all grown in. My parents, my sister, and I went to the Tunnel of Love at the end of March. It wasn’t the most photogenic time of year. The lack of greenery didn’t stop us from having a photoshoot. Here Taras from Cobblestone Freeway Tours shows off his moves. A woman sells magnets to us, likely the only visitors for the day. The track was filled with greenery and tourists when we returned at the end of April. When I went with my family to the Tunnel of Love, we wandered around Klevan a bit, including to the nearby 15th century castle. There are only remains left. Beside providing castle duties, the castle has also housed a school, provided homes for people affected by war, and served as a base for police during Soviet Union times, according to this website. If you don't have a chance to explore the Volyn country-side, then you can still get a taste of it on the outskirts of Lutsk. Compared to other Ukrainian cities I've lived in, there are more houses in Lutsk (other places have mostly apartments), and on the borders of the city or down side streets, there's a country/village feel. Find a fountain to sit on to do one of the most entertaining past times in Ukraine — people watching. Photo by Hannah Picklyk. My friends and I accidentally once saw all of Lutsk on the city bus. We were heading to PortCity mall, but took the bus that was coming from there, rather than going there. So we had a small adventure, but we covered a lot of ground and got to see parts of Lutsk we didn't know existed. And on the note of buses, I highly recommend them as a mode of transportation. Look up bus times on Google Maps or ask around which one to take. The buses come often enough and have their destination written on a board at the front. And for 20 cents CAD, no harm done if you take the wrong bus. I didn't know much about Lutsk before moving there — and there's not much up-to-date travel information online about the city. But one search result is a self-guided walking tour that my friends and I did to orientate ourselves with the city. Lutsk is a beautiful city. It reminds me of my hometown, Winnipeg, actually. Lutsk's Voli Avenue to me is comparable to Winnipeg's Portage Avenue. Both have everything you need — they're close to downtown, they're lined with restaurants and shops, and they are walkable (though Portage Avenue is kind of never ending), making them great meeting spots. And, like Winnipeg, Lutsk is an underestimated city. Before moving to Lutsk, Ukrainians I've met along my way told me I'd be bored, with nothing to do or see in the city. Right away I could tell they were wrong. And I hope you give the city a chance too. After all, if you're in Ukraine, then it's likely you'll make a stop in Lviv. Take a short 2.5 hour car ride, and you'll be in Lutsk. And if you go, which I hope you do, then please say hello to my friends from Волинський народний хор, who I miss dearly. I like Lutsk because it’s full of contrasts — on a street parallel to the clean, beautiful, and well-kept pedestrian street, you’ll see buildings like this, covered in garbage, falling over, and abandoned. Poet Lesya Ukrainka lived here, in the Kosach family home. We went to School #25 a couple times during our stay in Lutsk. One time we went so students could practise speaking English (which they were great at, by the way). Hannah Picklyk took this photo of me admiring one of the murals in the school. If you walk to the edge of Central Park, you’ll hit the Styr River in Lutsk. People fish, cook shashlyk, and play games in the area. Central Park is full of benches, paths, and greenspaces for locals to enjoy. In Central Park, there’s an amusement park. Do Hannah, Kaitlyn, and Natalya have matching sparkly market shoes? Of course they do. Lutsk is full of beautiful greenery and flowers, including on its buses.